Ternate Island. 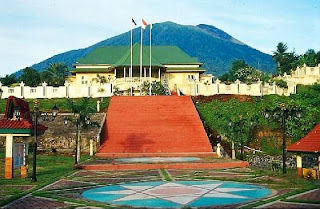 Ternate, an island off the west coast of Halmahera, is just 15 sq. km in size but it offers a treasure of sights and experiences. There is an active volcano named Gamalama, two lakes, an old Sultan’s palace, a picturesque port and several good beaches. The peak of Gamalama is 1,271 meters high and can be reached by trail. It has three craters and its surrounding environment is very beautiful. Stones from Gamalama’s eruption are scattered across the landscape. Both Lake Laguna, 7 km from town and Lake Tolire, 24 km from town, can be reached by car. About 4 km west of the town, is the Afo clove tree, which is said to be more than 350 years old. Good beaches are to be found at Bastion, Ngade, Sulamadaha and Tobololo. Ternate Bay is popular for fishing and motorboats can be hired to take you to the best fishing grounds.